Sunrise Landing is located 22 miles North of Traverse City and 3 miles South of Northport. 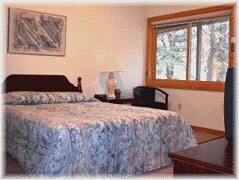 We are situated right on West Grand Traverse Bay and have 150′ of private Lake Michigan beach. Sunrise is central to all the villages and attractions in Leelanau County, so you can branch out, yet never be far from home. Unwind at the end of a long day by building a beach fire, then lay back and enjoy the stars from anywhere on the grounds. In the morning, we’ll have muffins, pastries, and juice in the lobby. And as always, freshly made coffee is always brewing. All units have views of the bay and open up onto our large grassy yard. There is plenty of room for kids to run and play, or for you to lay out and read a book in our signature colorful adirondack chairs. The beach, just a few steps from your room, has a nice swimming area (don’t forget your water shoes!) and plenty of sand to lay out or build castles. Our classic rooms have the original tongue and groove cedar walls, which give off that special warm feeling our guests love. These rooms can either have 1 queen bed, or two double beds, complete with a sitting area, writing desk, microwave/fridge, and flat screen TV. Each of our suites have a unique floor plan and feel to the room. The biggest draws to these remodeled rooms are the spacious layouts, whirlpool tubs, separate bedrooms (which gives an apartment-like feel), large kitchens and living rooms, and custom gas fireplaces for cozy fall and winter nights. These country-kitchen rooms feature our warm tongue and groove cedar walls, 2 Queen Beds, flat screen T.V., sitting area, writing desk, and a fully equipped kitchen/dining area. Some units have the option to connect to an adjacent room, creating an apartment-like setting.